Yogamaharishi Dr. Swami Gitananda Giri is truly one of the most significant Yogis of our times and played an important role in the revival of the traditional teachings of classical Yoga in modern times. Known as the 'Father of Scientific Yoga' he combined his scientific background with the ancient techniques of classical Yoga that he studied in his youth with his Master, the Bengali saint Yogamaharishi Swami Kanakananda Brighu. The result is what Swami Gitananda called "Rishi Culture Ashtanga Yoga" and is now known worldwide as "Gitananda Yoga". The beauty of Gitananda Yoga lies in its step-by-step approach towards Yoga that is also beautifully outlined in the correspondence course "Yoga: Step-by-Step". 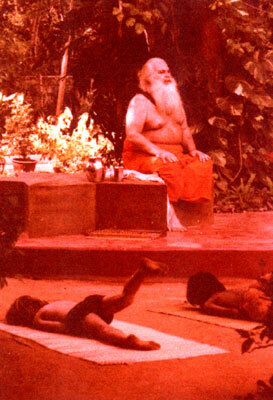 Taken to their full potential the values and techniques Swami Gitananda taught can lead the student to the experience of Yoga (unity). To view some techniques of the Gitananda Yoga Tradition please go to LEARN YOGA. To the benefit of the student, Swami Gitananda implemented the concept of the Guru Kula to instruct (structure) his students. Guru Kula literally means the womb of the Guru. The student is nourished spiritually within the protective ambience of his Guru's presence, until he is strong enough to stand on his own two feet in the world. Life in the "Guru Kula" in India has always been disciplined, simple and natural with an austere dignity. The student, called a "Chela", was expected to possess many qualities, including discipline, sensual control, purity of body, mind and emotions, willingness to learn, humility, intelligence and respect for the teachings and the teacher. The Guru Kula was also the home of the Guru and the teachings were taught in an intimate, family relationship. In such a setting the Guru could closely observe the student and understand his weaknesses and his strengths. The Guru Kula installed at ICYER was the last place where Dr. Swami Gitananda taught (in physical presence) before leaving his body in 1993. The ICYER is located five kilometers north of Pondicherry, South India at the Bay of Bengal. 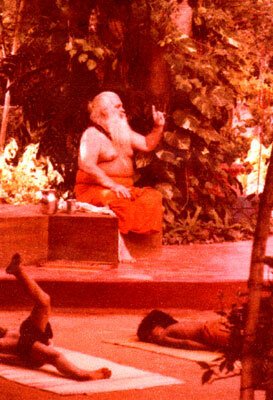 There Dr. Swami Gitananda gave his Six Month Residential Yoga Teacher Training Course as he had done ever since 1968. Today his son Yogacharya Dr. Ananda Balayogi Bhavanani and Swamiji's wife and chief disciple Ammaji, Yogacharini Meenakshi Devi Bhavanani continue the work of Swami Gitananda at the ICYER. Would you like to know more about Gitananda Yoga? This 3-page document explains the core concepts of Gitananda Yoga. 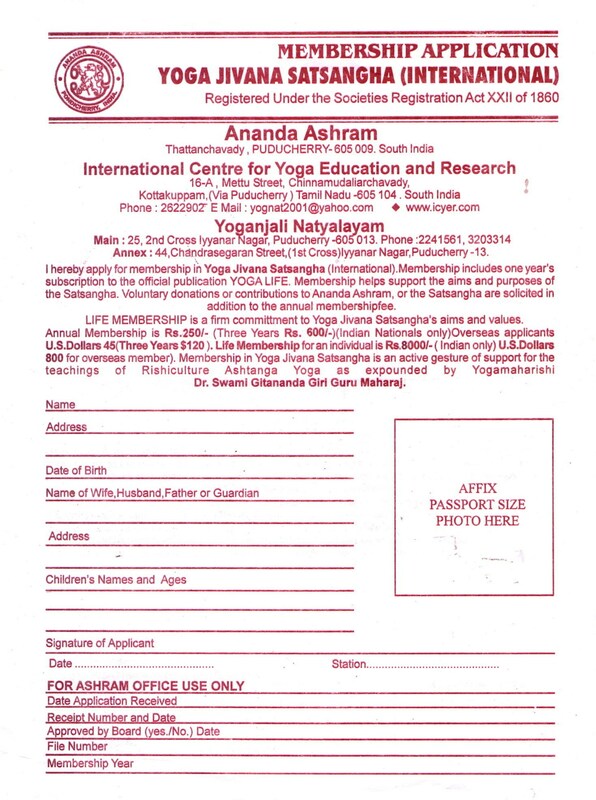 To become a member of Yoga Jivana Satsangha International and receive our international monthly journal "Yoga Life" please download and send us theapplication form by post or e-mail and we will inform you how to transfer the requisite membership fees.